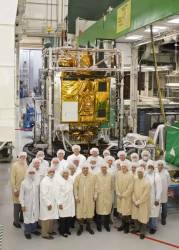 The Boeing Company has announced completion of the latest in a series of environmental tests of the first of 12 GPS IIF satellites, which confirm the mechanical integrity of the spacecraft. Having apparently overcome technical problems that have delayed the program for several years, the program is now on track to deliver the first satellite to the U.S. Air Force this year, according to the company, with launch currently scheduled for the first half of 2009. Most recently, the GPS IIF team completed a series of acoustic tests that replicate the noise levels expected during the spacecraft’s launch into orbit. The tests are being performed under the supervision of the Air Force, the Aerospace Corporation, and the Boeing team at Boeing’s satellite factory in El Segundo, California. The GPS IIF program recently completed a successful mechanical solar array deployment test and delivered upgraded software for the control segment that will support the first and subsequent GPS IIF launches.